You are here: Home / Invitation / Time to kill the printed benefit auction invitation? Time to kill the printed benefit auction invitation? One of the questions — well really, one of the responses — caught my eye. For ease of reading, I’ve posted the entire question and the responses below. What grabbed me was that 71%. Not just a majority, but a whopping majority, responded that they prefer to give online, through the Website. Now of course, this is just a quick survey on Twitter. I don’t know how many respondents weighed in. But upon seeing that 71% number, it did get me to thinking about its application to my niche. I’m wondering whether guests to our auctions would actually prefer registering for the event online at the organization’s website instead of mailing in their benefit auction invitation and check? Certainly their are advantages to directing guests to an online registration process. I’m a fan of that.. You capture their card information, they spell their own name online so your volunteers aren’t misspelling any names as they input registration information into the database, etc. But I’m specifically wondering about eliminating the invitation and ONLY sending out an evite. But this quick poll on Twitter is an interesting data point. Whether it’s the canary in the coal mine foreshadowing a certain death of traditional mail fundraising — or printed invitations — is yet to be seen. 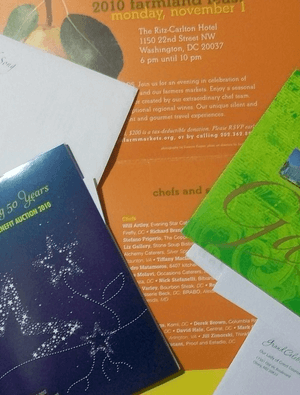 But certainly as tech-savvy and tech-comfortable donors age, the electronic version of the benefit auction invitation will be used more often, thereby saving planners of auctions the costs of printing and mailing invitations. Those tend to be two of the traditionally more expensive areas of an auction budget, so reducing those costs is a good combination, indeed.